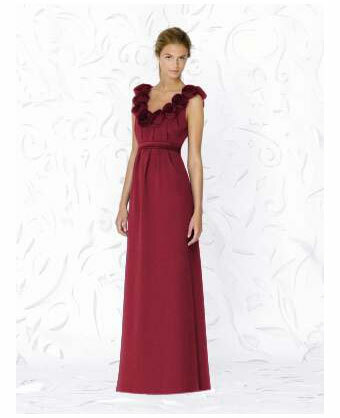 As was true for most of 2010, bold rich hues will continue to dominate weddings in the fall and winter months of this year. Purples, browns, reds, blues, oranges, hot pinks and slate will be the season's hottest colours. Purple: purple is hot and will continue to be for the rest of 2010 but not just any purple will do. The shade to look for is actually violet. Brown: brown is always a wedding favourite but the traditional chocolate tone is being replaced with this season's "it" hue, mocha. Red: red is always a popular choice when jewel tones are in style and thankfully with red, we have a wider range of hues to choose from this year. Anything from a deep rich red to dark watermelon tones are the best choices. Orange: this beautiful and popular fall colour comes with a slight twist this year. Think coral. Any warm orange tones that are somewhere between orange and salmon (orange with a hint of pink) will be super hot this upcoming wedding season! Blue: blue is another fabulous jewel tone that makes any gown look regal but this year, the trend is toward the fun tropical blues like turquoise and teal. Gray: you may think that gray sounds boring as a wedding colour but "slate" or "pewter" gray which is the "in" hue is nothing short of elegant. Its hard edgy look adds drama and a modern, urban appeal to any look. 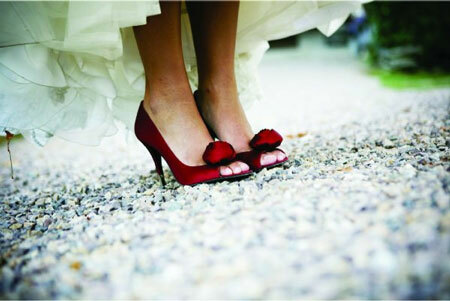 Pink: hot pink or magenta to be exact is an excellent, bold colour choice for your fall or winter 2010 wedding. Pair it with dramatic black accents and your wedding will not soon be forgotten by anyone attending! Green: green is always on everyone's list of favourite wedding colours especially when jewel tones dominate the fashion runways. This year's take on green, however, is more muted than bold. A mossy or olive green will complete your look for a 2010 event. Sage green is also an excellent choice. Yellow: a light, soft greenish yellow hue is the shade you are aiming for when it comes to this particular colour. Remember yellow comes in all sorts of shades; so be very careful when choosing to ensure you have the right hue for this season. Golden: golden yellow or rich, deep autumn gold is a very elegant choice in bridal hues for this season. Its warmth adds an extra "glow" to any fall or winter evening.